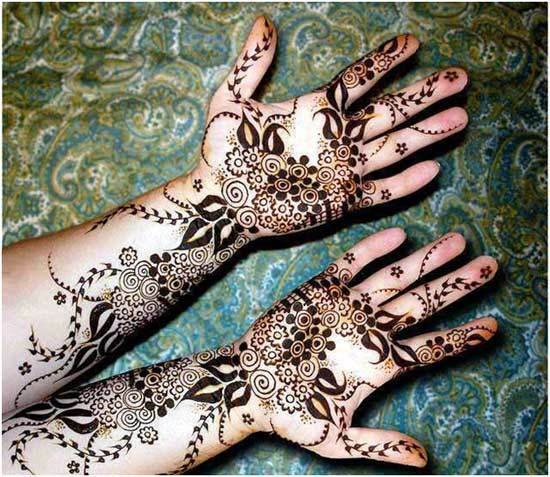 Black Mehndi, also known as Chemical Mehndi, is the resultant of mixing chemicals and dye with henna. Black Mehndi designs done with the help of the black chemical cone, creating the borders and filled in with henna/mehndi give an amazing dual colour effect and look really beautiful when applied on hands or feet. 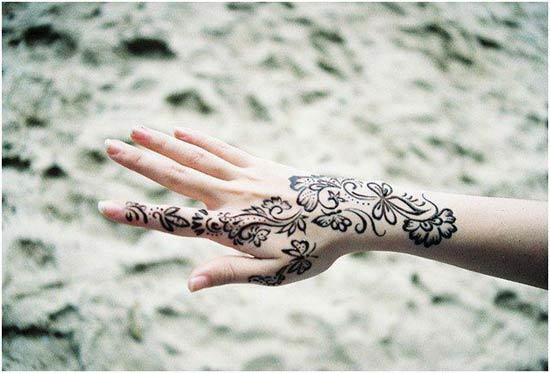 A lot of Arabic mehndi designs feature black mehndi as well. Black Mehendi is the preferred choice of many for festivals, occasions and weddings or even for casual wear since it imparts a look different from the usual mehndi we do and provides sharper, stronger colour and more prominent designs which lend a great attractive effect. Whether used for outlining or by itself, black mehendi designs beautifully imbibe the traditional with the modern, thus being trendy and classy all at the same time. 1. 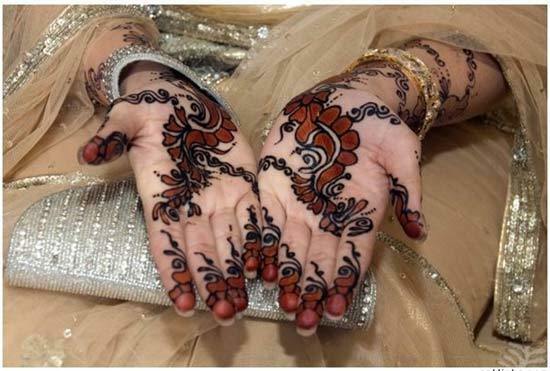 An outstanding Black Mehndi design, this fills the entire hand and even the finger tips are filled in, making for a great choice for brides on their special day. 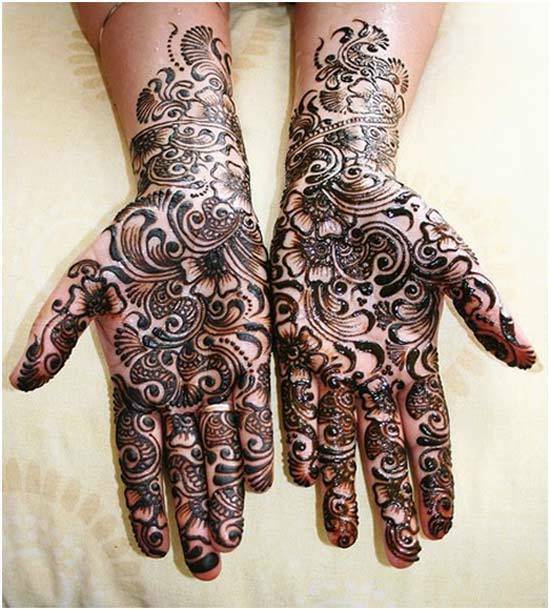 A mixture of intricately done gorgeous patterns, the use of black mehandi helps in creating the beautiful prominent designs, lending a unique look. 2. 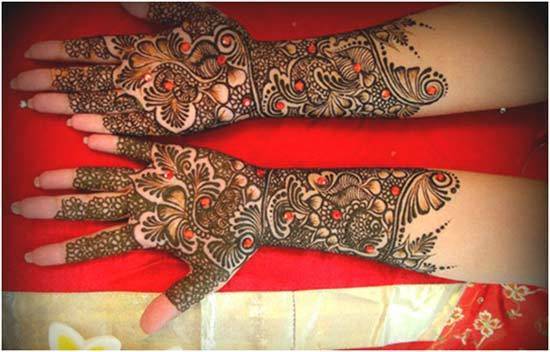 This Arabic Mehndi design makes predominant use of Black mehendi to create an appealing and traditional yet modern design. Using thick lines, prominent borders and shading, the floral motifs are brought to life. This black mehndi design will glam up and complement your festive attire through its sheer beauty. 3. A perfect pick for any black mehandi lover, this design covers around three-quarters of your hands, leaving the finger tips untouched for that balanced yet gorgeous look. The design is enhanced with the use of red beads and the predominantly floral, weave and traditional motifs bring out its true beauty. 4. Want a simple mehendi design with absolute no fuss? This one is a beautiful design that will be perfect for casual wear as well for those who cannot wear heavier designs to work/office. 5. 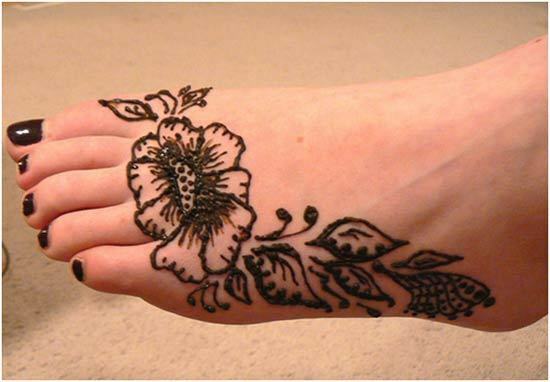 A clutter-free beautiful black mehndi design for the feet, this looks really chic and trendy. This simplistic design with floral patterns can be worn on any occasion and even to work if you want to wear mehndi on your feet and yet not opt for a heavier design. 6. 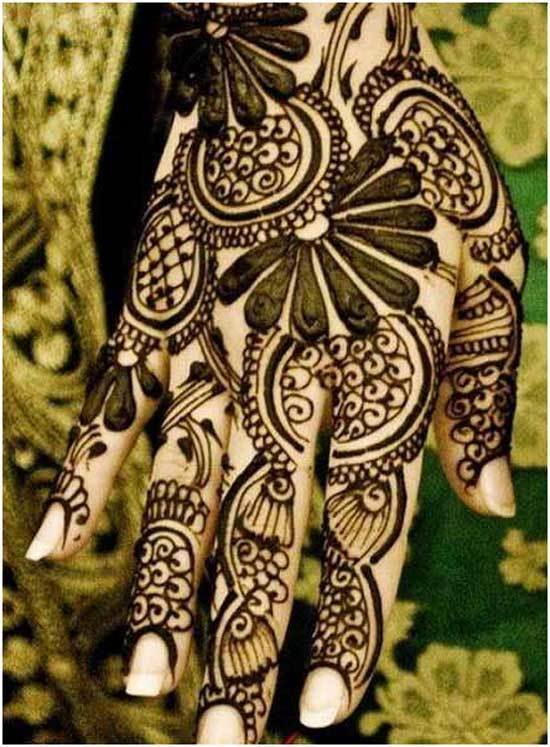 If you are a bride-to-be and looking for an exquisite black mehndi design, how about this pattern that we love? 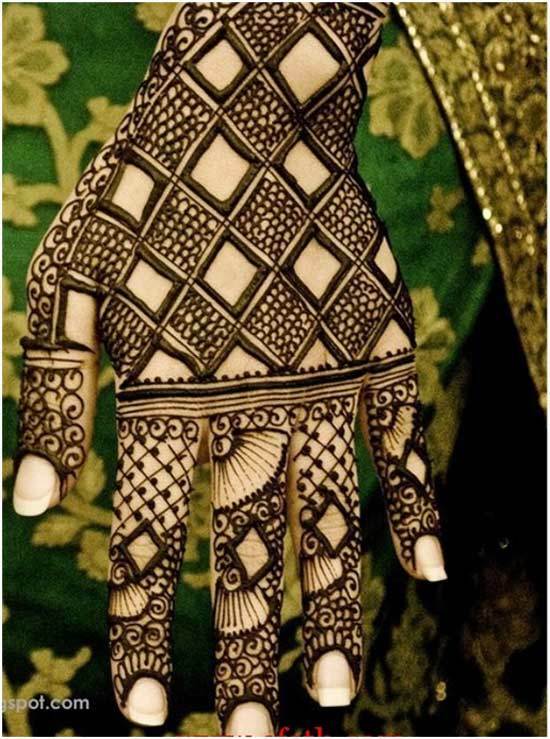 The patterns are not messy but very gracefully done and the finger tips have been left open in this unique style which borrows heavily from Arabic mehndi designs. 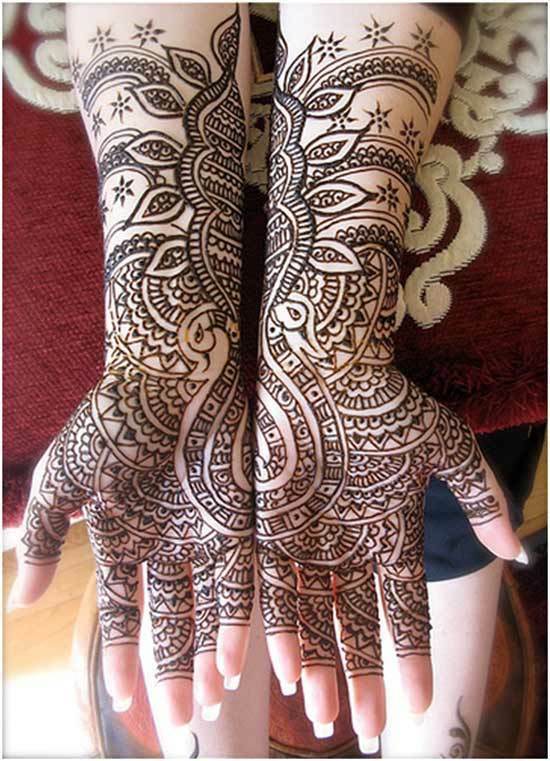 We think this mehandi design is just awesome! 7. This gorgeous black Indian mehandi designs combining floral motifs and delicate weave patterns can be used to fill up the back of the palm. Classy and elegant yet so attractive, this unique design will surely draw attention! 8. 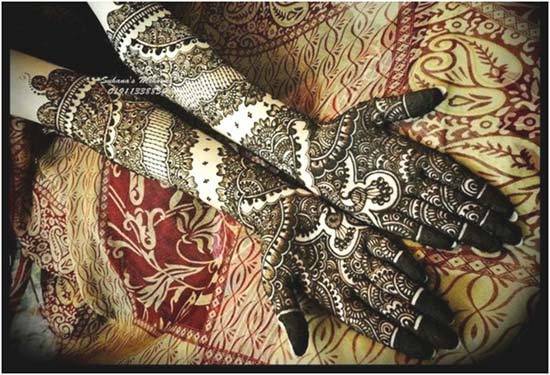 Here’s another glamorous black mehndi design that will easily add to the beauty of the bride’s hands on her special day. The alternating filled and empty rhombus patterns with intricately done minute and varied patterns looks extremely alluring and attractive. 9. A pretty black outline mehndi design features dual color effect using red and black mehndi for the outlines, the effect is kept simple yet looks lovely. This style would look great on festive occasions, wedding invitations or Eid. 10. This extravagant mehandi design is perfect for wear on festivals and grand occasions. The entire style is endowed with a modern touch and the use of black mehndi makes the floral designs stand out prominently, thus looking gorgeous on the hands of anyone who wears this.